There were quite a few grid designs included in the new sketches for November from Simple Scrapper. 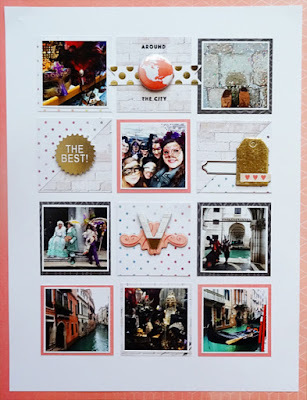 Which was perfect for documenting several of my photos from a Venice trip earlier in the year. i think it's kind of cool to combine a whole variety of photos on one page, including different view points and details. It can be difficult to use photos which have different colours in though. i chose to go fairly neutral with my choices and then mix in one paper which featured several colours. 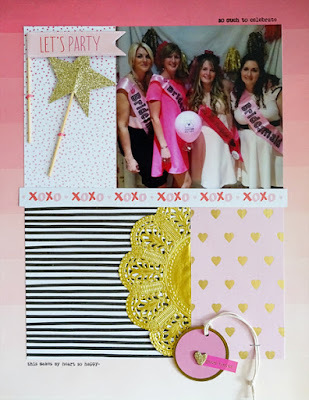 i used papers from the Pink Paislee C'est La View collection, and embellishments from My Minds Eye. 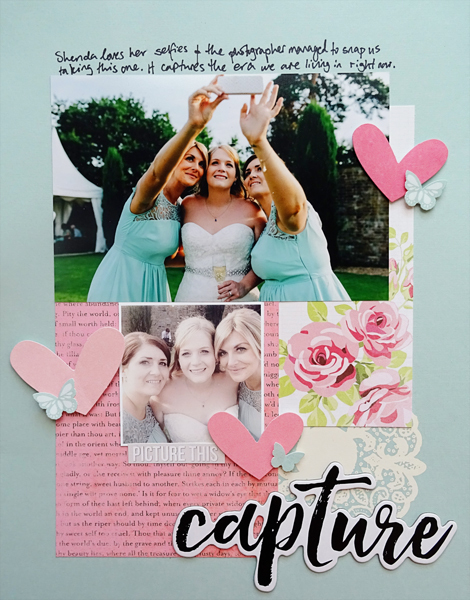 The next page features a photo from my sisters wedding. The photographer snapped us taking a selfie, and i also included the selfie on the page. i thought it was a fun capture of the culture we are living in right now. i used a Hambly rub-on which i have had for eons. It still worked! Which i was pretty pleased about. It's always a gamble, so i wouldn't suggest hoarding things like rub-ons. The original sketch featured circles, which i switched out for hearts. i am a huge fan of Halloween. Last year i was lucky enough to spend it in America and go actual trick or treating with my friend Meghann and her daughter Lizzy. So fun! 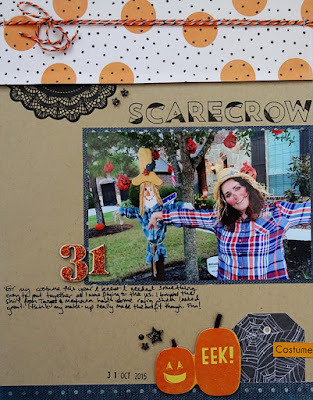 i knew i needed a fairly simple costume as i didn't want to have to pack a load of extra stuff so i decided to be a scarecrow. i picked up the shirt in Target and Meghann had some rafia that was a great substitute for straw. 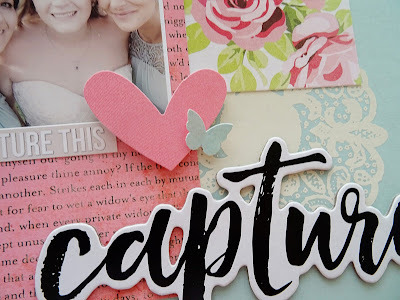 Whilst i was in the US i picked up a bunch of scrapbooking goodies including some of the After Dark collection from Crate Paper which i've used here. 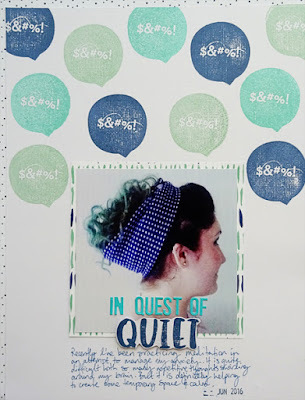 Because of the blue in my shirt i also used some navy paper from a Maggie Holmes collection. i'm not sure why, but there doesn't seem to have been as many Halloween collections released this year. 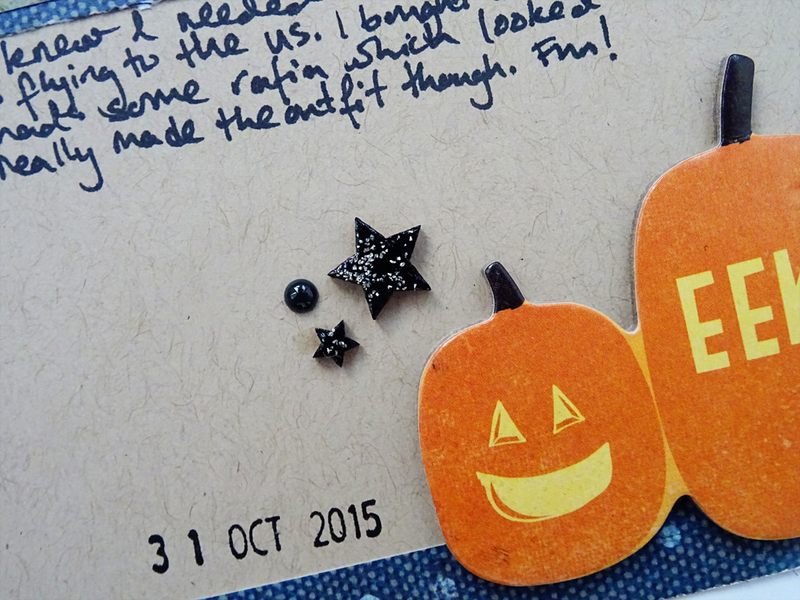 Just as well as i have plenty in my stash to document a fair few more Halloween's! i decided the wood veneer stars needed a bit of dressing up so i inked them in black and sprinkled some glass glitter on them. Then used a liquid adhesive to seal it all in. i hope if you are celebrating Halloween you have a fun and safe night! 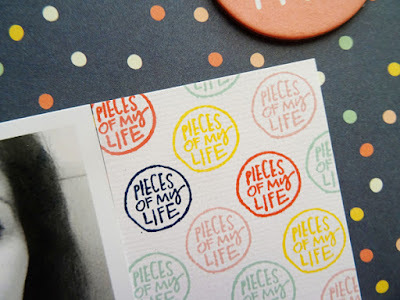 Still subbing to the Ali Edwards Story Stamp and i was totally all over the 'Me' theme last month. i also had the Story Kit to play with. Warning - lots of selfies ahead! The colours in the Me kit work well with the Posh line from Simple Stories, which is one of my current favourite collections. 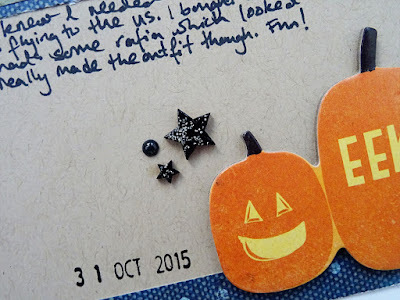 i used a card from the kit and paired it with one of the stamps to jot a few current 'right now' facts. Pretty sure i've mentioned before how much i enjoy looking back on these kind of pages that document little snapshots of my life. i made my own patterned paper by using different inks and repeating the same stamp in a random formation. Currently really into this technique. 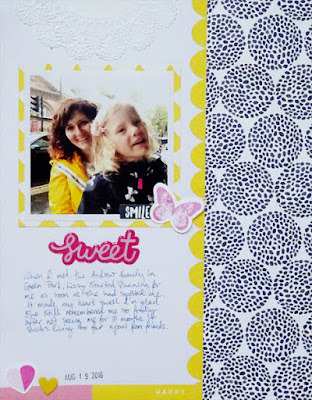 For this layout i used a mix of the Me, Read and Believe kits/stamps. Love how the themes for the kits often cross over so they can be used together. 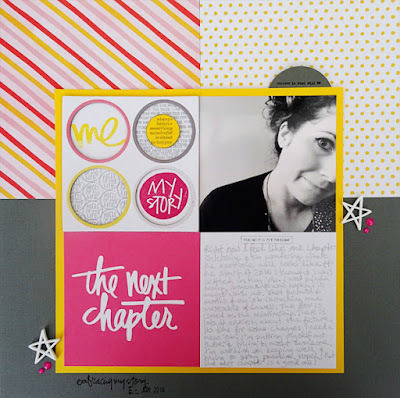 The idea for the page came from a prompt in the Read kit, 'the next chapter'. There's a lot of uncertainty about my future right now, so this is a page about that. 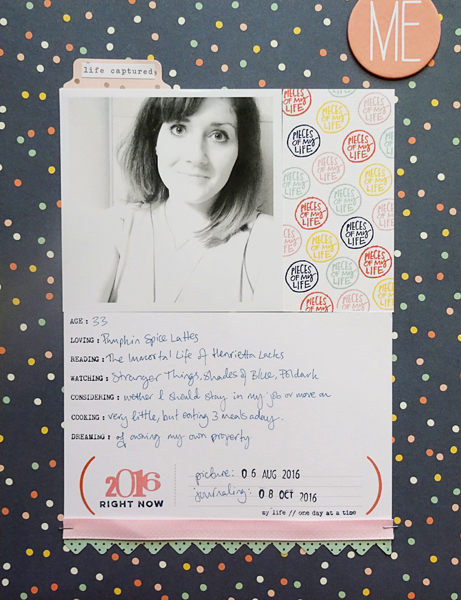 In my journaling i've tried to keep things hopeful. i went for a classic grid design. And the main design feature is the leftover chipboard from the Me kit that i used to house lots of stamping. i also made another layout which lists 5 'around here' facts. 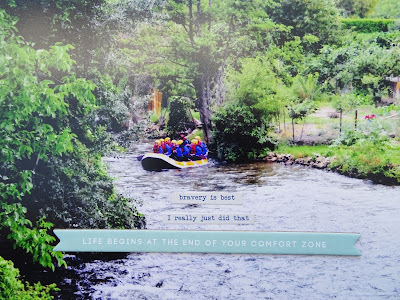 i included a mix of fun stuff and not so fun stuff, always trying to keep it real. 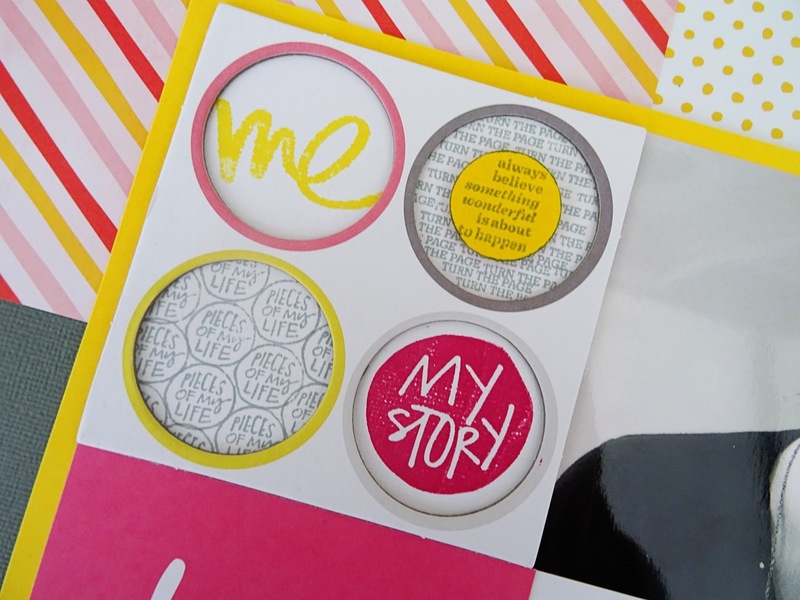 This features a stamp from the Prompts kit and uses the I Am collection from Simple Stories. 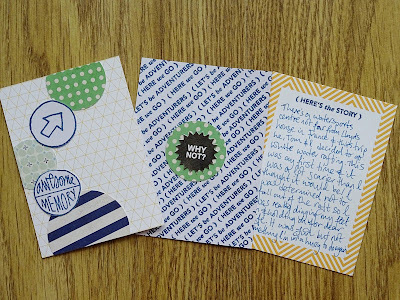 This design is a good way to use up some paper scraps. i used a piece of 6x12 cardstock for the base and glued scraps of paper around the edge. Then i layered another piece of cardstock on top, that was 5.5x11.5. i'm glad to have some snippets of my life in 2016 captured. 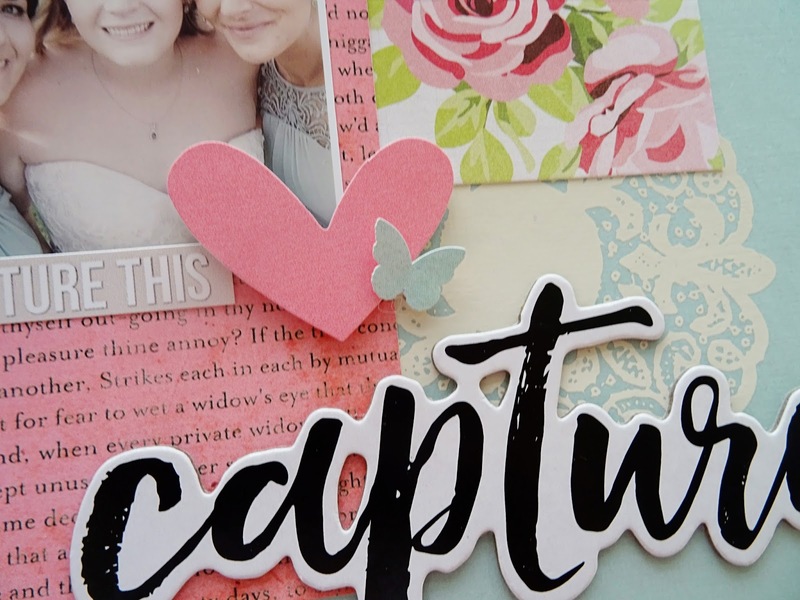 But additionally the process of scrapbooking some of this stuff is therapeutic and helps me work through my thoughts. i know a lot of people shy away from scrapbooking about themselves, but i wish more people would try it. 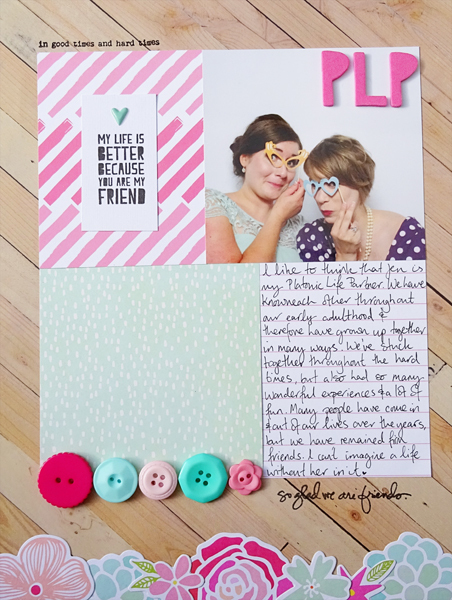 It's important to have you in your scrapbooks! For my October Simple Scrapper layouts i chose to use 2 of the sketches. The below is a design i would never have come up with myself. That's what is great about sketches i guess, they can sometimes push you out of your comfort zone. i used a kit from Hip kits so it came together really quickly. This next layout is simple, even for me. But i like that this makes the photo the focus of the page. i snapped this at the WWII memorial in Washington DC last year. It was touching to see women being honoured for everything they contributed to the war. i used elements from various Ali Edwards Story Kits, i've found that a lot of the themes work well together. As is my trademark, there's lots of stamping on this layout. 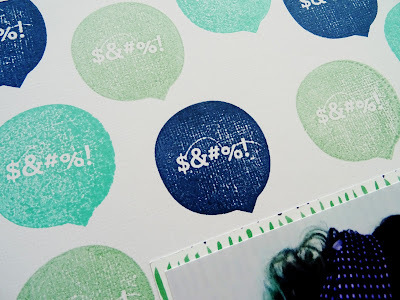 i stamped part of the title on white cardstock and then hand cut it out, using pop dots to give it a bit of dimension. i also used a speech bubble stamp to create my own sort of background paper. This was my second attempt. i wasn't completely happy with the first one, so i gave it another go getting the spacing a bit more even the second time around. i like that you can kind of get a sense of what the page is about without having to read the journaling, from this motif being repeated. 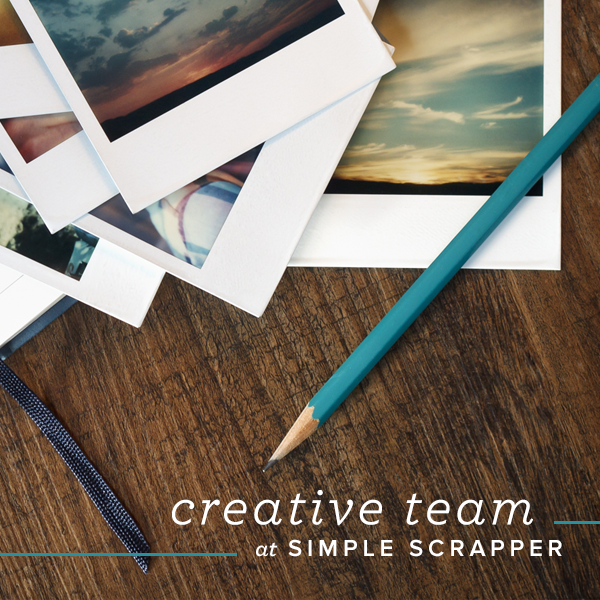 For September, the creative team at Simple Scrapper had the option to choose a sketch from the archive to work with or create a layout with an accompanying pocket page. i chose the latter. Here's a close up of just the layout. 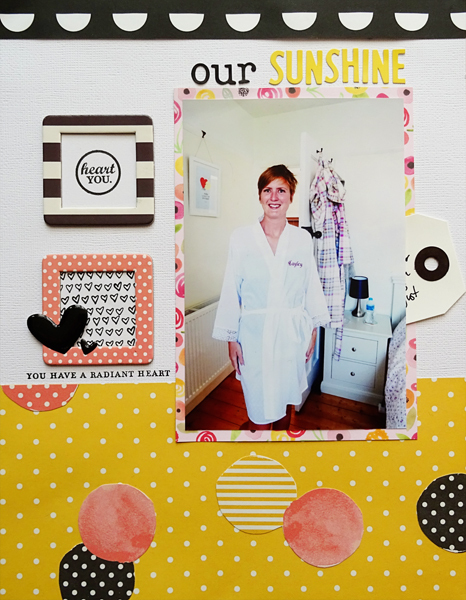 Because i knew i had enough photos to include a pocket page, i intentionally ordered an enlarged photo for the layout. i knew i would have plenty of pockets to include my journaling in so i could get away without including any on the layout. Instead there are some word stamps and stickers to help further tell the story. Here's a close up of some of the embellishments i used on the layout. 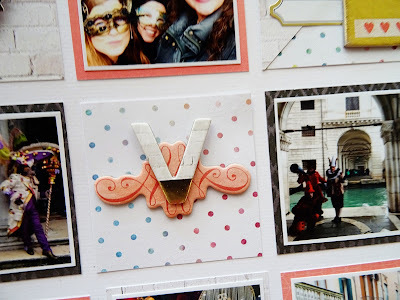 Using an enlarged photo meant there was plenty of space to include embellishments directly on the photo. And these are some of the 3x4 cards from the pocket page. i created the background on the card in the middle by repeating a couple of word stamps over and over diagonally on some white cardstock. 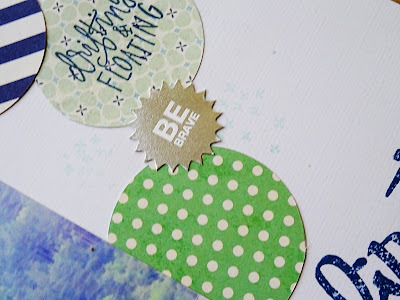 i then layered some patterned paper with one of the silver embellishments. The card on the left mimics the circles on the main layout. 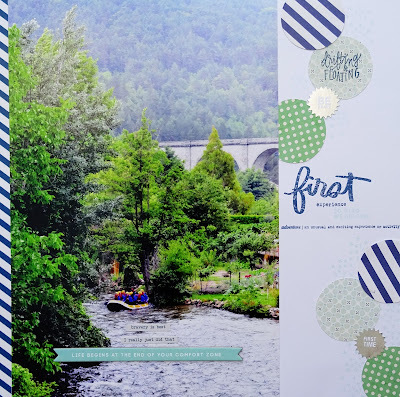 i placed it in the furthest pocket on the left to create a visual triangle across the layout and pocket page. The summer months often entail travel and so this months theme at Simple Scrapper is 'Exploration'. 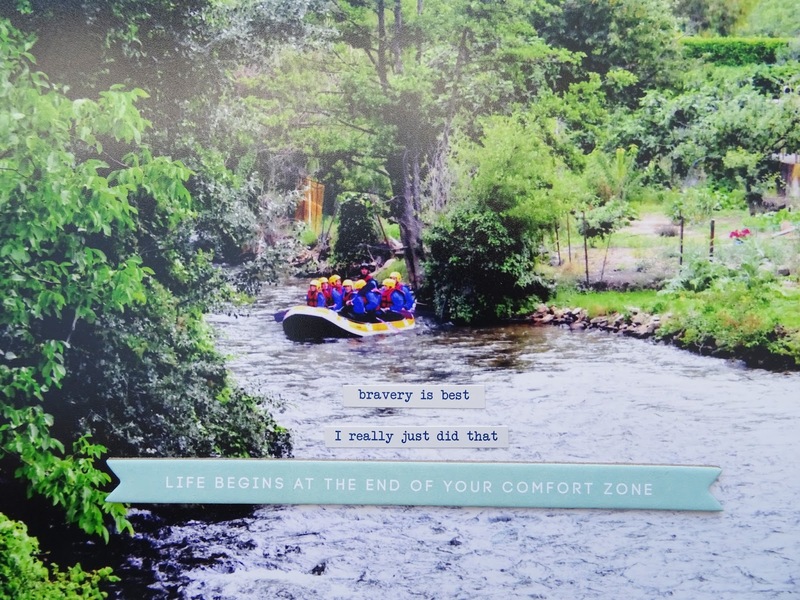 Of course, there are lot's of different prompts to inspire you if travel isn't part of your story. 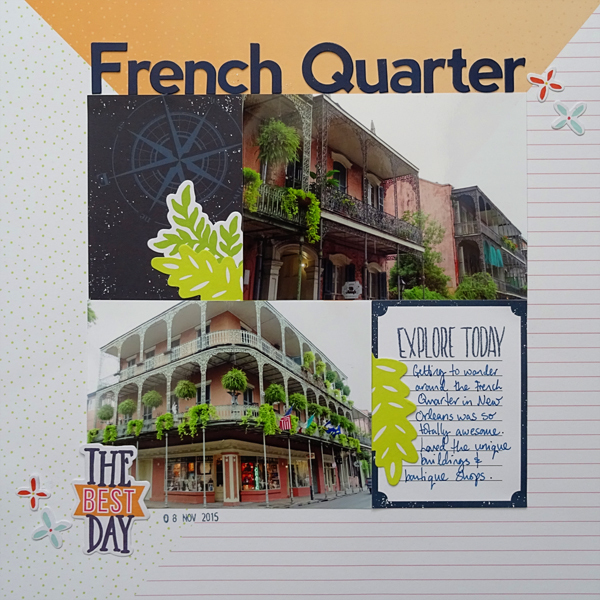 i however, have lots of travel photos to scrap and ended up creating a grand total of 4 layouts based on the prompts. i'm also the cover girl for the spark magazine this month, which is always exciting! This first layout used a sketch from the Simple Scrapper archive. i was looking for a sketch which used 2 4x6 photos and with the way the archive is set up it's easy to find layouts by photo size or number. The sketch was very simple so i chose this background paper deliberately as it adds interest to the page. i have plenty of photos from the French Quarter in New Orleans so i will likely create an accompanying pocket page at some point. 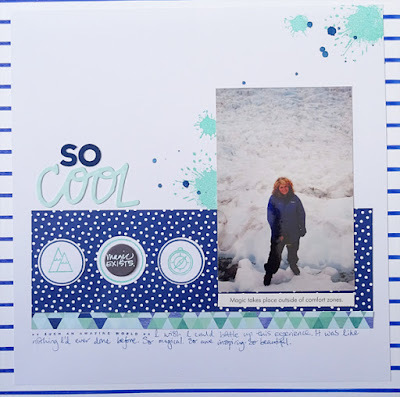 To create this layout i gathered a bunch of different supplies including some Ali Edwards Story kits & stamps 'wild' and 'magic' which seemed to work with the exploration theme and just played. On my this layout, i did something very out of character. Used a whole pack of rub-ons in one go! i really like how it looks, but i did find it hard to cover some of it up. i was comsidering using multiple photos for the layout but decided this photo was monumental enough to speak for the story. This month i used the same sketch twice. 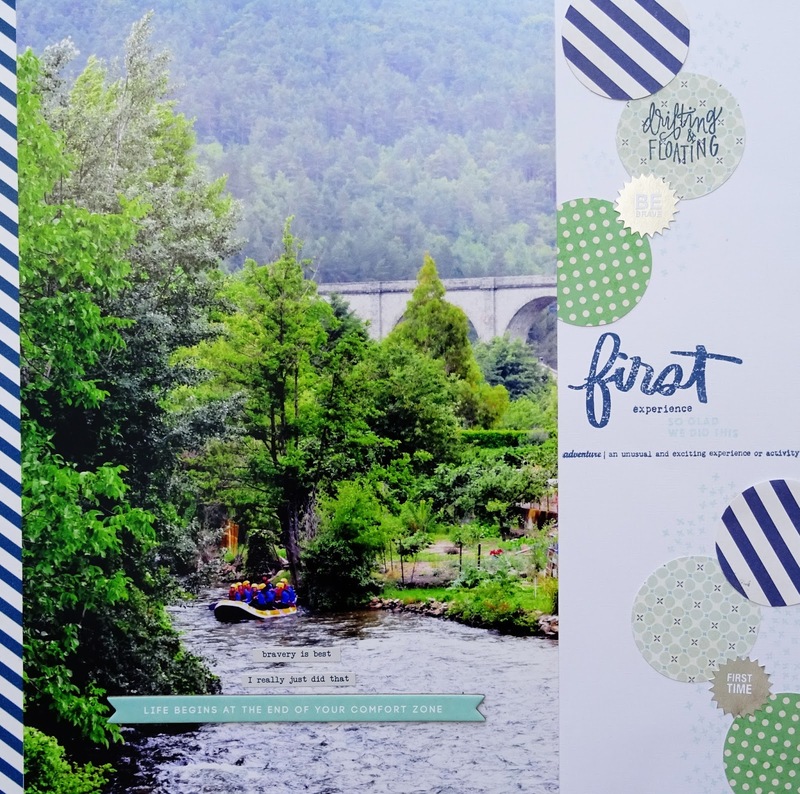 You can definitely tell that i used the same sketch, but i used a different set of products for each layout so i still think they look pretty different. 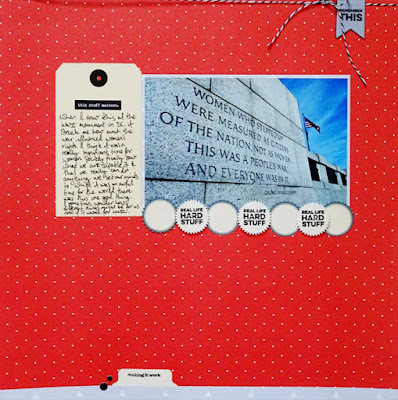 To create the border at the bottom of this layout i made by layering die cuts and then trimming the excess off the end of the page. Die cuts are something that i can struggle to use so i will repeat this technique again. This one was a 'just for fun' layout, i have lots of photos from this particular event so i'm ok with having a couple of layouts which don't have journaling or a particular story. 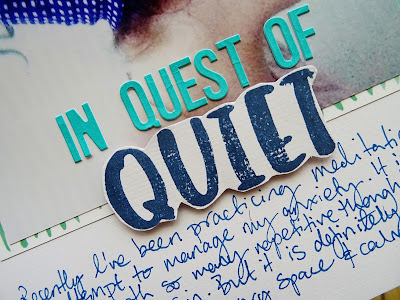 i like how the ombre paper looks in the background, subtle but effective. Using a border strip across the middle is a good way to tie the layout together. Rather appropriately for the month of July, the theme at Simple Scrapper is Sunshine. This can be interpreted in lots of different ways. 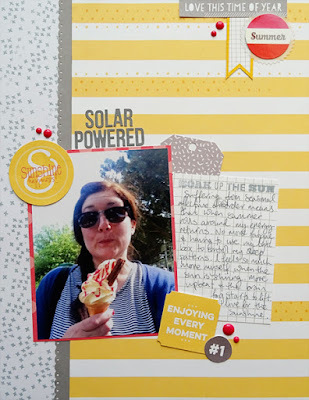 This first layout i did using the story starters is about how my energy returns in the summer. Suffering from Seasonal Affective Disorder, i literally feel like i'm solar powered. i've used yellow to represent the summer months but also included the grey colour to reflect how i feel during the winter. 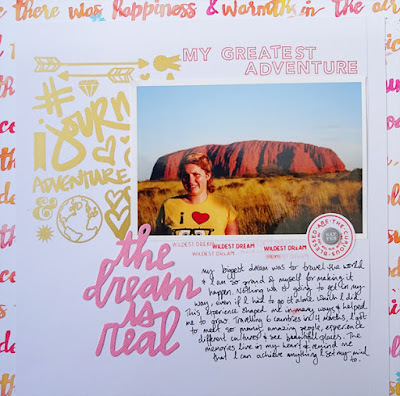 Scrapbooking & adventures of a curly haired girl who lives on the south coast of England. Visit Alexa's profile on Pinterest. This work by Alexa Gill is licensed under a Creative Commons Attribution-Noncommercial-Share Alike 2.0 UK: England & Wales License. Please don't use any of my pictures without asking my permission first. Feel free to use my pages as inspiration for personal use only & if you do so, please let me know. i'd love to see! Thank-you.